Bill Epps was born on December 5, 1900 in the unincorperated community of Orin, Kansas. He was the second of five children born to James R. and Sallie Bessie Epps. He was reared on a farm in Gove County, Kansas and known as “Willie” as a youngster although that changed to “Bill” as he got older. His father took a job with the railroad and moved the family to Oakley, Kansas where Bill and his brother, Howard, found jobs as automobile mechanics in a local garage. Before long, Bill Epps was driving racing cars. Although not totally unheard of, it was at least uncommon to see a black man driving racing cars in those days. 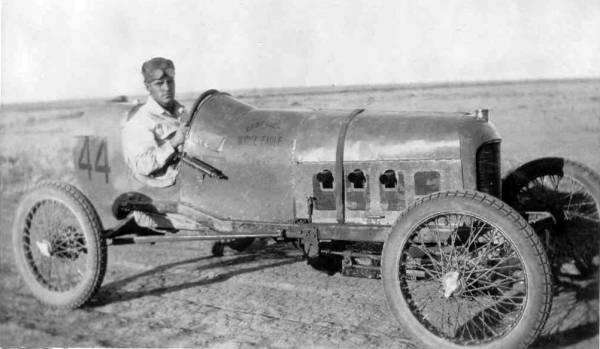 His first race that we have found record of was the Fall Speed Classic run on October 9, 1926 at the Western Kansas Motor Show. That race was run before 5,000 fans on the new one-mile dirt oval Widdifield Farm Racetrack located in a field just north of Oakley. Epps finished third in the 50-mile feature race that day behind Jim White of Sharon Springs, Kansas and Harry Kurtz of Voda, Kansas. Epps was driving a four-cylinder Fronty Ford #44 known as the P.E.B. special. It was owned by Pierre “Pete” Bertrand who, with his brother Ernie, had built the car with sponsorship from White Eagle gasoline. Thus, the P.E.B. special got its name from Pete and Ernie Bertrand. The next races that we know of that Epps competed in were twin 10-mile events run on the Widdifield Farm Racetrack on December 5, 1926. In the first of these races, Epps was running in third place in the P.E.B. special when the two leading cars ran into trouble on the sixth lap propelling Epps into the lead. From there, he went on to claim his first known racing victory. Epps’s elation was short lived however as the P.E.B. special dropped out of the second 10-mile race that day with engine trouble. More than 5,000 people attended the next race where Epps is known to have competed. It was run on July 4, 1928 on the new one-mile American Legion racetrack located on the southwest edge of Oakley.  Epps pushed the Bertrand brothers’ P.E.B. special to the quickest one-lap time of the day in time trials of 45 seconds flat around the one-mile dirt oval. Since that was the first ever event on that racetrack, it automatically became a new track record. Epps then won the first 10-mile heat race of the day finishing 23 seconds ahead of Lee Hillery of Winona, Kansas who was driving Cecil Wright’s #99 Wright special. Epps’s time of 8 minutes, 10 seconds over the 10-mile distance also set another new track record. Epps then started the 25-mile sweepstakes race only to drop out on lap 21. Since only three cars completed the full distance, Epps was credited with fourth place. Epps entered the P.E.B. special in the races run at the Trego County Free Fair at WaKeeney, Kansas on August 31, 1928. There, he won the “fast car race” over Walter Krhut of WaKeeney and then finished in second place behind Krhut in the “Free-for-All” race. Not many people attended the races run on the American Legion racetrack on October 27, 1928. Epps took the P.E.B. special out last of the 14 cars that took time trials that day but he did not complete the one-lap distance and the problem was apparently terminal as the car did not start in any of the other events that day. Epps entered the P.E.B. special in races at the American Legion racetrack at Oakley on July 4, 1929 but no records or results from those races have been located to date. Epps entered the P.E.B. special in the races run on August 30, 1929 at the Trego County Free Fair at WaKeeney, Kansas. He finished second to Tom Holden of WaKeeney in the “Fast Car Race” before winning the “Free-for-All” race, finishing in front of Holden. The next race on the American Legion racetrack at Oakley was run before a large crowd on October 6, 1929 under the sanctioning of the Consolidated Auto Racing Association of Denver, Colorado. Epps drove the Bertrand’s P.E.B. special to the quickest time of all the competitors in time trials that day running one mile in 44.5 seconds. Epps led the second five-mile heat race for one lap but then the P.E.B. special suffered a broken crankshaft knocking him out of the event on the second lap. In Epps’ next known outing, he won $100 driving the P.E.B. special to a first-place finish in the sweepstakes race before a big crowd at the American Legion racetrack on August 10, 1930. He had covered the 10-lap distance in 8 minutes, 34 seconds. Epps entered the P.E.B. 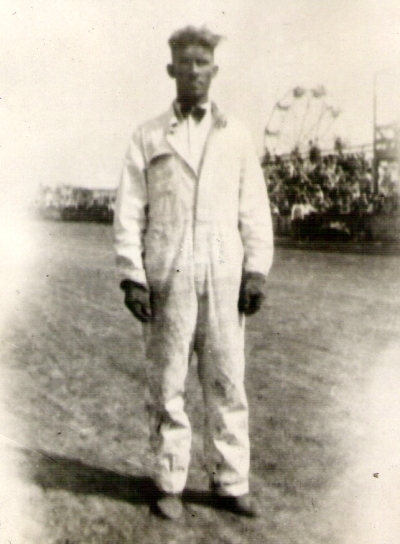 special in races at the North Central Kansas Fairgrounds in Belleville, Kansas run on August 28 – 29, 1930 but it is unknown if he actually competed there, or not. If he did, he did not place in the money. In a race that was run on September 12, 1930 at Hugo, Colorado, Epps was seriously injured when the P.E.B. special collided with another car and overturned several times. The car was destroyed in the crash. Epps had also entered a race at Oakley scheduled for two days later but his injuries prevented him from being there. Promotional material for that race had claimed that Epps would drive around the racetrack “at speed” blindfolded during intermission that afternoon. 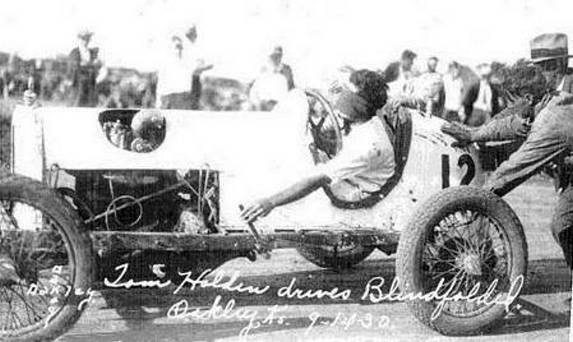 Due to Epps’ injuries however, race promoter Tom Holden of WaKeeney performed the stunt instead. Pete and Ernie Bertrand built another #44 P.E.B special in time to enter a race at Oakley on October 26, 1930 but Epps was still laid up from his injuries so Pete Bertrand drove the car on that date himself. Bill Epps was married on November 17, 1930 at Burlington, Colorado to Grace B. Nolind who had been residing at Colorado Springs. She was a daughter of John E. and Laura (Youthz) Nolind, prominent farmers in Logan County, Kansas. Epps entered the P.E.B. special in races at the Stull Speedway south of Lamar, Colorado on Memorial Day, May 30, 1931 winning first place in the 10-mile sweepstakes race there that day. He is believed to have raced at the same racetrack the next day but nothing more than the sweepstakes winner's name (Earl Hovenden of Los Angeles, California) is currently known about the races there that day. 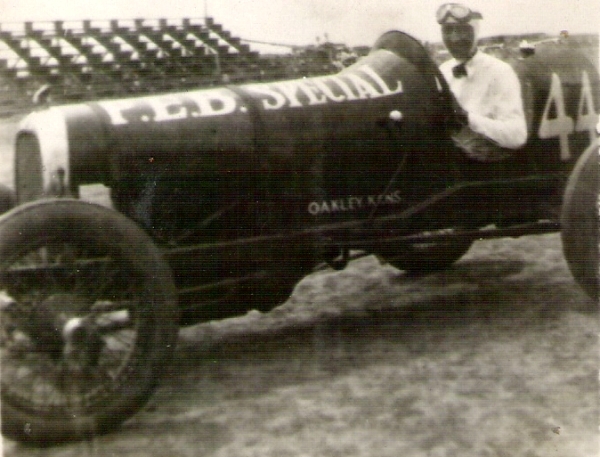 Epps was entered to compete in races at the American Legion racetrack at Oakley on August 2, 1931. The sweepstakes race that day was won by Pat Cunningham of St. Joseph, Missouri who was driving a double-overhead cam Fronty Ford #K-1 owned by Leonard Kerbs of Otis, Kansas but little else is currently known about those races. Grace Epps was white and her family was less than thrilled that she had chosen to marry a black man so she and Bill decided to get away and move to Denver. On May 29, 1932, Epps drove Pete Bertrand’s #44 P.E.B. special in a race on the new 5/8 mile high-banked paved oval Dupont Speedway on the northeast edge of Denver in Commerce City, Colorado. He finished second behind Bill Carroll in the third elimination race. Epps returned to the Dupont Speedway the next day and placed second in the consolation race behind Jack Fowler. Epps entered races at the Southwest Fair at Dodge City, Kansas run on September 30th and October 1, 1932 but no results of those races have been located. 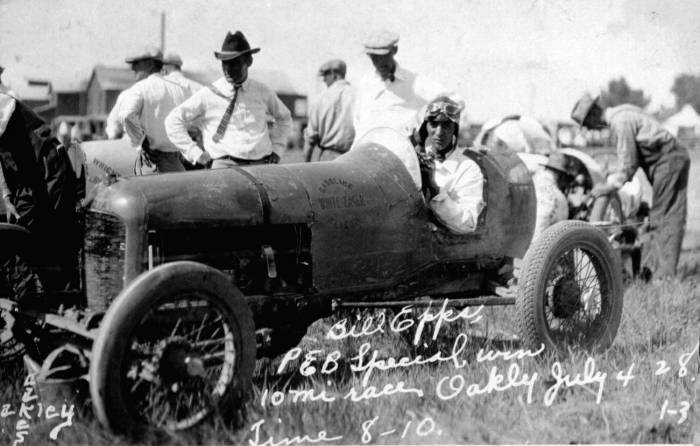 Epps went into semi-retirement from racing for a while but then obtained a ride in Walt Killinger's beautiful and well prepared Cragar powered automobile from Denver. His first known race in that car came on August 20, 1937 on the ½ mile racetrack at the Thomas County Free Fair at Colby, Kansas. 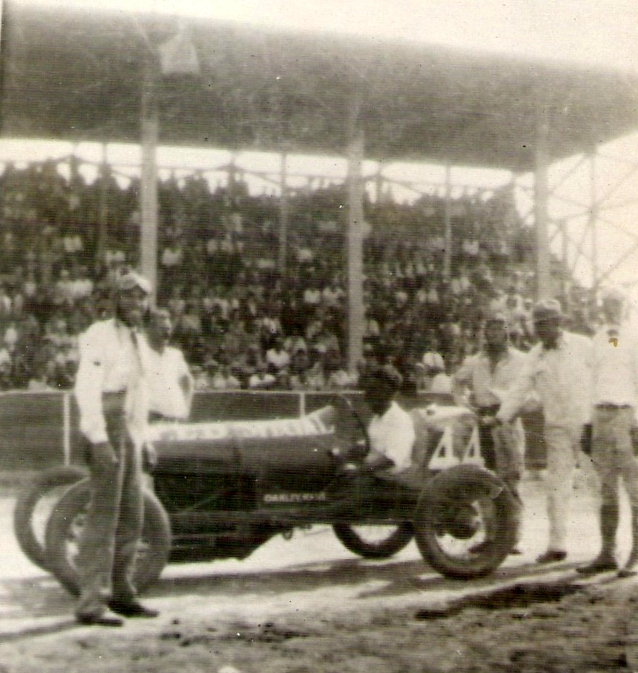 Epps won the second five-lap heat race that afternoon and then finished second to Brick Harris of Boulder, Colorado in a novelty race where the contestants raced for one lap, got out of their cars, then drank a bottle of pop and ate a bun before getting back into their cars and racing for three more laps. The time reported for that four-lap event was exactly the same as the time it reportedly took Epps to win the five-lap heat race earlier. Epps then finished third in the ten-lap feature race behind Harris in Matt Culver's single-overhead cam powered Fronty Ford, and Bill Harding from Hastings, Nebraska who was driving his own Riley. Epps' next race was on August 25, 1937 on the half-mile dirt oval racetrack at the Northwest Kansas Fairgrounds at Goodland, Kansas. In the first five-lap heat race that day, Epps crashed into the fence. He was not injured and was able to repair the car in time to start the second heat race. Epps finished second to Tom Murie of Hays, Kansas in that five-lap contest. Epps won the fourth five-lap heat that day just edging out Bill Harding in a time of 3 minutes, 51.1 seconds. Epps then started the feature event in the fourth position but he was not a factor at the finish. Two days later, Epps showed up at a race at the Trego County Fairgrounds in WaKeeney, Kansas. The crowd of 10,000 people on hand saw Epps finish third in the first five-lap heat race and then come back to win the ten-lap feature race on the half-mile dirt oval in 4 minutes, 31.1 seconds. He started that race from the front row, took the lead in the first turn, and stayed in front for the entire distance. The next day found Epps on the ½ mile racetrack at the Colorado State Fairgrounds in Pueblo where he finished second in the first five-lap heat race to Bob Vorbeck of Denver who was driving his own Cragar powered #1. Epps then led the third heat race for the first three laps before being passed by Vorbeck on the final circuit. Epps led the ten-lap feature race until just past the halfway point when he was again passed by Vorbeck. Epps still managed to finish the race in second place behind Vorbeck. Bill and Grace Epps moved to Rawlins, Wyoming in 1938 where Bill took a job working as both a mechanic and bus driver for the Greyhound Bus Line, driving a route for them between Casper and Rawlins, Wyoming. 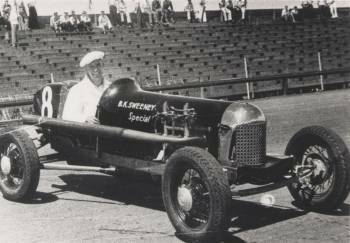 A promotional piece in a local newspaper said that Bill Epps would be competing in the midget races on the 1/5 mile racetrack at the high school stadium in Casper, Wyoming on the evening of June 24, 1938. The races did take place but there was no further mention of Epps, or if he actually competed in those races. On June 26, 1939, Epps drove a Ford V8-60 powered midget #9 at the Merchants Park racetrack in Denver but, to date, no further mention of his involvement in racing has been found. The Epps were still residing in Rawlins as late as April 2, 1940 but then moved on to Casper, Wyoming where, by 1943, Grace had taken a job as a cook at the Hi-Way Cafe and Bill was driving a bus for the Wyoming Motorways Company. Bill was driving a taxicab in Casper when he was involved in a collision there on February 14, 1944. He was not injured in the accident although a female passenger in the other car did receive serious injuries. Bill and Grace Epps had recently purchased a home in the Casper suburb of Mills, Wyoming when, early on the evening of Monday, June 5, 1944, Bill Epps walked into the Arcade bar at 214 South Center Street in downtown Casper where he spotted a good friend and co-worker - another taxicab driver named John Lorenza Sampson, sitting at the bar. Sampson offered to buy Epps a drink but Epps declined saying that he would take a cigar instead. Epps sat down on a stool to the left of Sampson and the bartender brought him a box of cigars. Epps selected one and lit it. A moment later, witnesses heard a muffled explosion. Epps slumped forward toward the bar before falling on the floor with blood flowing from the right side of his abdomen. Sampson held up his left hand from which blood was streaming, and a double-action .32 caliber pistol was taken from his right pocket. An ambulance was called but Epps passed away before they could reach a hospital. Sampson was also taken to the hospital as the bullet had severed his middle and ring fingers. Witnesses stated that the two men had not been quarreling. Sampson stated that the gun had accidently discharged when he reached into his pocket to get some change to pay for Epps’ cigar. Sampson was arrested and placed in the Natrona County jail pending a coroner’s inquest. The investigation revieled that Sampson had been carrying the pistol in his right pocket and had some change in the bottom of that pocket. He had reached across into the pocket with his left hand to hold the pistol up so he could retrieve the change from under the pistol, with his right hand. In the process, he accidently bumped the trigger on the pistol and the bullet that severed his fingers was the same bullet that struck Epps. After services in Casper, Bill Epps’ body was shipped by train to Oakley, Kansas for more services before he was buried in an unmarked grave in the Oakley Cemetery just outside of Oakley, Logan County, Kansas, although the cemetery is actually located in Thomas County, Kansas. That is the same cemetery where his parents are buried. The coroner’s inquest found that John L. Sampson was guilty of “gross criminal negligence”. With that finding, state law left the District Attorney no choice but to charge Sampson with manslaughter in Natrona County District Court and he was jailed there in lieu of a $2,500 bond. He was released on bail and his trial was postponed several times before he was finally acquitted by a jury on March 28, 1947 after a daylong trial. After the acquittal, Sampson got a job as bartender at the Radio bar in Casper before going to work at Casper Memorial Hospital for a few years before his death in 1967. After Bill’s death, Grace began driving his taxicab in Casper. She is listed in the Casper City Directory working as a “waiter” in 1945 and was married to Robert Oscar Freel at Casper in June of 1948. She was a widow again and residing in Cheyenne, Wyoming in 1953. By 1969, Grace was going by the name "Grace Yant" and residing at Lander, Wyoming. She passed away on October 23, 1986 at Riverton, Wyoming at the age of 79 and is buried as "Grace Epps" in the Mountain View Cemetery on the west edge of Riverton in a plot that was purchased for her burial by a local church. Bill and Grace did not have any children.